The adventures of Speed Racer have delighted animation fans for more than thirty years. 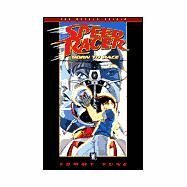 Now, the Demon on Wheel's latest adventures are brought to life in a spectacularly illustrated new graphic novel that draws on the Japanese mango drawing style of the original Speed Racer cartoons. This adventure tells the origin of the March 5, Speed's incredible car, and assembles the racing team that takes Speed to the finished line!